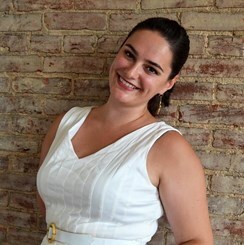 Claire Galloway Weber is a classically trained soprano and pianist who performs frequently in the Baltimore and Washington DC area in operas, as a soloist in oratorio performances, and as a professional chorus singer in large choruses such as Concert Artists of Baltimore and vocal chamber ensembles including The Bridge Ensemble. She has a Masters of Music from Peabody Conservatory and a Bachelor of the Arts from Bard College in Voice with a minor in Piano. Ms. Weber currently studies voice with Mark Schnaible in New York City. She can next be seen performing as Dinah in Leonard Bernstein’s Trouble in Tahiti in Baltimore with Stillpointe Theatre in January 2018. As a pianist, Ms. Weber has studied since childhood starting with the Suzuki technique and on through a minor at Bard College, which lead her to Paris to study with Elisabeth Sun-Perge at a conservatory for a semester. She has taught beginning and intermediate piano students of all ages for over a year using a variety of books to aid in learning theory, technique, musicality, and a love of piano. Having begun her love for music singing in choirs and school productions, Ms. Weber is very passionate about musical theater and choral singing as well as classical and operatic styles. She has taught private students and at multiple studios for the past 8 years in genres from pop and rock to musical theater and opera. Her main goal is ensure that students have a healthy foundation in understanding breath, support, resonance, and connection to the body so that they do not rely on other muscles, which may ultimately cause them harm. Request Lessons with CLAIRE today!